At Widlife Camp 60% of all the accommodation fees are donated back to the Wildlife and Environmental Society, which in return supports the wildlife and people of the Luangwa Valley and Zambia. 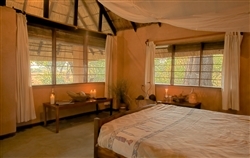 There is a selection of accommodation from the chalets to the tented camp, and a rustic bush camp. The chalets offer a classic combination of the rustic but comfortable. 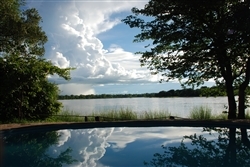 Each is en suite and offers a tranquil setting along the Luangwa River and lagoon areas. There are 9 chalets – including 2 for families. All have a veranda with seating that allows for relaxation, whilst watching the wildlife that is all around. 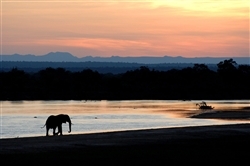 The tented camp has five en suite tents, all positioned with excellent views of the Luangwa River. Each tent has a small veranda in the front with comfortable chairs, two beds and an open-air shower and toilet. The main bar and restaurant caters for all tastes and is conveniently located in the centre of camp. All meals are prepared from local produce – indeed you might see local farmers cycling into camp with their vegetables of the day. The Camp also accommodates self-catering guests, for which kitchen facilities with basic utensils are available. There is a varied menu, starting with an early, light breakfast in the morning. After your return from the game drive, a warm brunch awaits you, before you start your relaxing afternoon at the swimming pool or a siesta in your chalet. When it is time to go out to spot some more animals you enjoy afternoon tea. You come back for a full three-course dinner after the drive. The is also the seasonal Wildlife Bush Camp, which offers guests a chance to experience an overnight walking safari - complete with bucket showers and meals cooked on an open fire. The camp consists of four twin tents, two bush toilets and bucket showers – it has no electricity and is basic in many ways but rich in atmosphere and location. 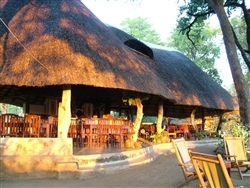 A morning walk will take you out to the bush camp, where the cook is waiting for you with refreshments. After brunch, a relaxing afternoon in the middle of the bush awaits you, with bird song, hippo conversation and other animal sounds. Regular visits from elephants or giraffes make the afternoon complete. After tea is served, the second walk of the day goes out to return just before sunset. 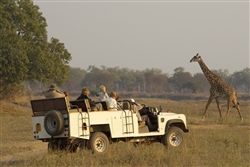 Game drives are offered in the early morning and late afternoon – where you get the chance to explore the area, and see some of the abundant wildlife, including some endemics, such as Crayshaw´s Zebra, Thornicroft’s Giraffe, and Cookson’s Wildebeest. In addition you might see elephant, hippo, lion, leopard, impala, waterbuck, hyenas, baboons, and warthogs. Especially in the dry season, herds of buffalo congregate and march en masse to the Luangwa to drink. Night safaris offer the chance to see civet, genet, porcupine and mongoose. You might also wish to do a Village Tour - this is a truly authentic Zambian experience and is only offered by the villagers themselves. You may have the opportunity of trying some local dishes, pounding some Mieliemeal for nshima, or just a strolling through the local village and having a chat at the local market.